My garden met an untimely demise this year. The squash beetles killed my zucchini, and well, all my squash. The early rain and overly hot summer nearly destroyed my tomatoes. I have five beautiful plants loaded with green tomatoes and nary a red one in sight. The movie may have made green tomatoes famous, but my desire to be relatively healthy prohibits me from frying so many of the odd-shaped orbs. I, along with many seasonal eaters and gardeners this year, have found myself in a bit of a fall-flavor pickle. However, necessity being the mother of invention, a seasonal eater can turn a troubled year for produce into a delicious fall and winter. Years ago I had an elderly neighbor, who didn’t garden, yet every fall when the weather turned too cool to ripen what was left on my tomato plants I could, and did, expect a knock on my front door from that sweet lady. She always made sure I was finished with my plants and if I would give her the green tomatoes that remained. I always did and now that we have moved and she is gone I miss her visits. She would come over with an old cardboard box and a stack of newspapers. I pulled them from the vines and she would wrap them in newspaper, set them in the box, which once full, would find its home in her basement for the rest of the season. She said she ate my garden tomatoes well into December. I have to be honest. I never tried it, but being the journalist I am I thought I would call the Douglas/Sarpy County Extension Office to see if the master gardeners had heard of such a thing. 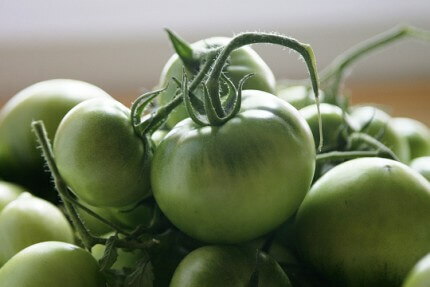 Tomatoes release Ethylene Oxide; a natural gas in produce, which when trapped inside a paper bag will ripen the tomato. If you want to store and ripen your green tomatoes well into the snow-covered months of winter its important check on them every couple of weeks. If you want to ripen your green tomatoes faster so you can use them in other recipes, Elkins recommends storing them in a brown paper bag with an apple or two. The accompanying produce will reduce the ripening time and you should have ripe, red tomatoes in a matter of weeks. Once those tomatoes turn red or you are clever enough to stock up on them during the final few weeks of the farmers market, use the cool days of fall to keep your oven on and your house smelling of the sweet sugars of summer’s mistaken fruit. Oven dried tomatoes are easy, can be frozen for up to three months and make great additions to salads and pastas or a simple and healthy snack. Preheat oven to 225 degrees, slice tomatoes a quarter-inch thick or less, spread on a jellyroll pan lined with aluminum foil or parchment paper. Drizzle with olive oil, sprinkle with kosher salt and basil (dried or fresh). Wait one-and-a-half to two hours. Let cool and eat right away or store in refrigerator in airtight container or freeze for up to three months. If oven-dried tomatoes aren’t reason enough to love your oven, roasting veggies should be what puts you over the top. Roasting is my favorite way to prepare vegetables. Roasting imparts a totally different flavor upon food. Yes, I swear, if you don’t like raw or boiled broccoli roasting it will make you rethink your taste buds. I serve roasted vegetables in all seasons. I eat them right away as a side dish or put them in the fridge and add them to salads for lunch. When the sky looks more grey than blue and the outdoors force me to switch from a t-shirt and shorts to a sweater and jeans, I leave the lettuce leaves behind and toss roasted veggies in a vinaigrette then add them to quinoa for room-temperature winter side. Roasting vegetables before adding them to soup can add a new depth and dimension. Roasted cauliflower and broccoli develop a wonderful nutty flavor. The easiest way to roast is chop your veggies, toss them in olive oil; kosher salt and pepper, spread them on a jellyroll pan in a single layer, then pop them in the oven at 375 for about 20 to 25 minutes. Flip them once halfway through. Once you get comfortable with this basic recipe, mix it up by adding different herbs and spices. I’m particular to roasting cauliflower with curry powder, butter and garlic. Eating seasonally is about making good use of what is available. It can and often does lead to exploring new flavors. The insects and weather may have taken a good share of fall’s harvest but they left plenty for the creative cook. This season take stock in what you have and create something tasty with it.